The numbers of Lithuanians travelling to neighbouring Poland to ski and participate in winter sports is rising. At Szelment sports and recreation complex, just half an hours‘ drive from Marijampolė, the vast majority of skiers and snowboarders using the ten slopes are Lithuanian, especially on weekends. “In one day of the weekend we get about a thousand visitors, 80% of them Lithuanians. They come from Marijampolė, Alytus, Kaunas. We greatly appreciate them. Those who come for more than one day are able to stay at our 30-bed hotel,” said Andrzej Ciesluk, the head of Szelment. 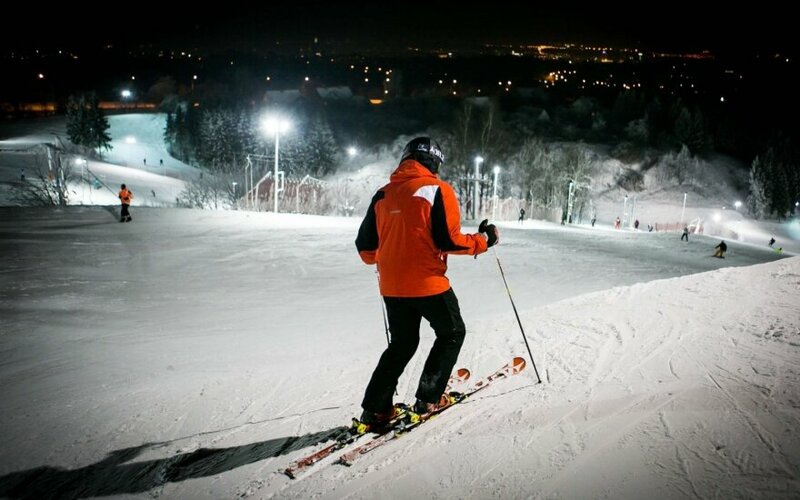 The winter sports complex is operating since 2008, it attracts Lithuanians not only with good slopes, but with low prices as well. Moreover, those who do not know how to ski, can get help from Lithuanian-speaking instructors. Rides on the ski-lift cost 2.5 zloty (€0.55) on weekends, and 1.5 zloty (€0.33) on weekdays. Hiring a full set of ski gear (skis, poles, boots) for the whole day costs just 35 zloty (€7.63). Ski enthusiasts said to rent the same set of gear at Liepkalnio track costs €7 for just an hour with a €2 charge for each additional hour. During the winter season, the complex attracts around 100,000 visitors according to Ciesluk.